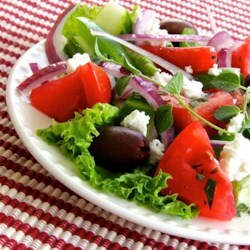 In a medium bowl, layer cucumbers, tomatoes, onion, bell pepper, kalamata olives, and feta cheese. Sprinkle with oregano, then drizzle with lemon juice and olive oil. Season with salt and pepper to taste.